Solas: Great battles thin the Veil. This region will be home to demons for ages to come. NOTE: For an updated and expanded map of Veil weakness (and additional analysis), please visit my later follow-up piece here. At the current pause in our story of Thedas after both Dragon Age: Inquisition (DAI) and "Trespasser," as of 944 Dragon, the Veil is the object at the very center of some of the biggest and most urgent questions now connected to the fate of its world and peoples. So in this post, let's take a closer look at the Veil—at what it is, how it works, and at what its state appears to be as our story stands now. As most Dragon Agers know, the Veil is the artificial, metaphysical barrier that separates the physical world of Thedas from the magical dream world of the Fade. While it's mostly referred to in metaphor as if it was a fabric separating the worlds, it's actually more of a magical vibration that covers Thedas. On the real-world side are physical beings, like elves, humans, dwarves, Qunari and others. On the other side, in the Fade, are metaphysical, spiritual beings like spirits and demons, and dream-consciousnesses. According to various sources (Vivienne, the Chantry, and implications from Solas himself), the Veil was created before humans ever touched Thedas. And, perhaps somewhat ironically, it's what enables the current world of Thedas to continue to function in a logical way several ages later. It's also, presumably, at least one part of the magical construct that has imprisoned both the arrogant, tyrannical Evanuris and The Forgotten Ones in separate, millennia-long, time-outs. But most importantly, the Veil allows each side of that barrier to exist in relative peace, keeping the physical world on one side and the dangers of the Fade precariously upon the other. Infinitely close (just a dream away) yet eternally distant, the Fade is a complex landscape—dangerous, alien and hostile, yet it's also beautiful and seductive. It's the home of all the purely spiritual beings, including demons, ghosts and maybe even the souls of Thedas (and perhaps of worlds beyond). It's also where the selves of mages and dreamers go each night when they sleep (only dwarves do not visit the Fade, except in the case of a dwarven Inquisitor, whose Anchor connecting them to Fade energies allows them to do so on a limited basis). Most crucially, perhaps, the Fade is also the essence and source of all magic. So mortal beings with magical abilities are all slightly connected to it (or near to it) at all times, and must learn to consciously manage and finesse those connections to manifest their spells and powers. Yet they must also do so without opening a wide enough channel to allow the entrance of demons—when this happens, in an event known as "Abomination," the mage is immediately possessed and transformed by a powerful demon, and must then be killed before further catastrophe or bloodshed can take place (Abominations have been known to be powerful enough to decimate entire villages). The possibility and fear of Abomination is the single biggest reason for the existence of the Mage Circles (and wary Templars) across Thedas. Despite its dangers, I've loved the idea of the Fade since the moment I heard it, and to me it's the metaphorical home of artists, thinkers, writers, and dreamers... in Thedas, and everywhere else. I love the idea of a communal, creative, and infinitely accessible dream world and wellspring—it's quite Jungian. Of course, it's worth noting that the Fade is also the place where Solas just happens to spend most of his time as its magical king and ruler; the place where Solas's power is at its height. Solas doesn't just walk the Fade, after all—he can work with its substance, craft and warp its very air like clay, and create whole new environments for those he interacts with there—settings that can be both seductive, or, perhaps... terrifying? And this is how it's been for ages of men... at least, since the world before (-3100 Ancient, or around 4,000 years before the Dragon Age setting of 941 Dragon as Inquisition begins). The Fade is a nightmare to some. But almost never, I suspect, to Solas. I always love this moment because it's one of the times Solas shows the greatest emotion—he actually speaks quickly and loudly, almost shouting. It's fun to revisit the scene (especially after "Trespasser") and realize that he totally gives himself away here on a number of levels. Yet his desperation is both tragic and understandable. Solas is, after all, half-drowning and barely out of panic mode. What happens when you lose the air... yet you're somehow still alive and breathing? This is the tormented reality Solas is living during DAI, and it's implied that his only relief is found in his romance or friendship with Lavellan, in his brief period of friendship with his adventuring companions (especially Cole), or most of all when he can revisit those past glories in his journeys in The Fade. Walking in "a World of Tranquil"
The people of Thedas are, of course, used to the protective muffler of The Veil. But to Solas it feels oppressive and suffocating—I actually wonder if a physical side effect of this disconnection is why it takes him such a long time to regain his powers upon awakening. After all, he no longer has access to the magic that he could once have pulled from the very air. Now he's got to access tiny tendrils of magic through the barrier of the Veil into the Fade, stuck high and dry like everyone else. This is why it makes so much sense that Solas is not a remarkable mage at this point—not just because he's still weak from his long sleep even a year after his awakening, but because he's also literally having to relearn magic in a world in which the magic has been locked away. The progression as he reattains that power is especially notable (and subtly perfect) when he attains Rift Mage status at Skyhold. (I further headcanon that he continues to grow in power and capability from there, but that he hides his abilities, successfully, for the most part.) It also explains his prodigious abilities in the Fade even weakened and still awakening, as in the Fade there would be little to no recovery needed. He can and does kill there (with regret, and with impunity) as the god he is. In other words, when we first meet Solas, in fact, in the Frostbacks, he's still arguably in the throes of PTSD, and walking in a muted, horrified silence, passing through, as he describes it, "a world of Tranquil." It's a pretty grim idea when you think about it, and it definitely gives me some empathy for the somewhat proud, prickly and distant Solas we meet at the beginning of DAI. But if you explore it further, Solas's words also give us an idea of how fiery, emotional and passionate the elven people must have been in the ancient days of Solas's youth. No wonder he tells the Inquisitor he loves her after just two kisses (albeit there's a year of potential interaction to precede that, including subtle implications of many other interactions and conversations, as well)... Solas comes from a time in which passions and tempers both burned hot and fierce. Meanwhile, this is what Solas has taken away... from his people, and from himself. But for Solas to fix his mistake, for him to redeem his past actions and rescue his people... for them to breathe that heady mixture of magic and air again? No matter how much he abhors the idea... this world must burn. But I'm betting it won't. For the most part, living beings and spiritual beings cannot pass through the Veil very easily, so each is mostly stuck to living on one side. Every rare while, spirits are called or push through benignly, like Cole (or... Solas? But more on that another time...) to gain physical form. And once in a rare while, living beings survive actual, physical time in the Fade—like the Inquisitor, after the Temple explosion. And again (with their companions), after Adamant. Ultimately, more or less, as far as the Veil's functionality is concerned—it works as designed. It's nearly impossible for spirits nor mortal beings, for the most part, to pass physically through the Veil, so each side is protected from the other. The consciousnesses of most mortal dreamers and all mages are a different matter (though the average dreamer is unlikely to ever be more than vaguely aware of such 'travels'). Elven Dreamers or Tevinter somniari can come and go at will, while elves in uthenera exist there in a constant wave of color, knowledge and impression. Mages visit more warily, most of the time in their tests of magical skill (for Circle Mages, the test known as the Harrowing). As the main storyline of Dragon Age: Inquisition progresses, the health of the Veil is a constant source of discussion—logically, of course, since we're walking around healing Rifts with our Inquisitorial superpowers. However, let's take another look at the subtext of DAI. At first, all the talk of the Veil seems to be focused on the Rifts. But that's not actually the case. Instead, as we journey across Thedas and the story moves forward, we're constantly made aware that the Veil itself is thin and fragile in hundreds of spots, and furthermore, actually torn everywhere, in a thousand places—places of battle, of Blight, of great death or dying. And every time, spirits cluster at these places, hungering to enter our world. 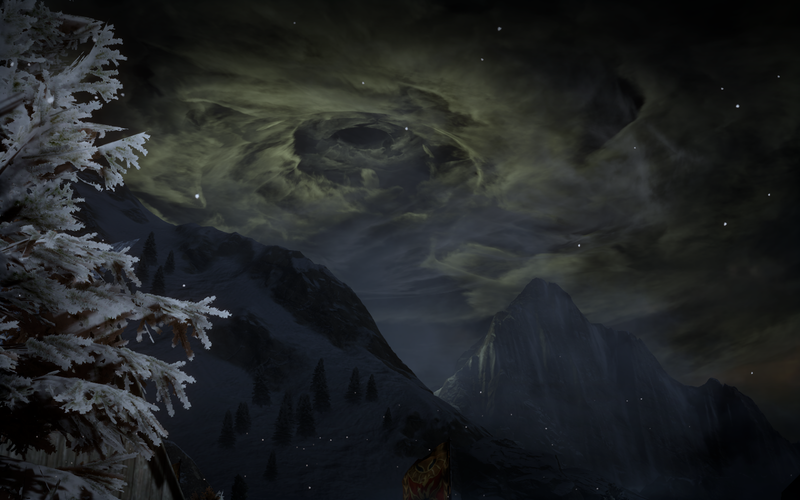 The skies above Thedas in DAI are as torn and frayed as the Veil itself. These thin or weakened places in the Veil can evidently be sensed with a greenish tint to the air—something poor Tamlen references in Dragon Age: Origins, in the Dalish Elf origin, also explaining that the Dalish call such thin places in the Veil setheneran (which roughly translates to, "land of waking dreams"). Sera also hesitantly echoes this idea in multiple ways when she describes what she sees to Solas later on, in DAI, when he encourages her to describe what she sees when she looks up into the Breach. Elves who visit areas where the Veil is thin may feel energized and strengthened, and Solas implies this as well, in his scene with a romanced Inquisitor in the ancient elven shrine in Crestwood. Speaking of which: It's somewhat ironic, but I can't help but wonder if that lovely and subtly thrilling presence of the thin Veil may not have been the very thing that ultimately doomed the Inquisitor's relationship with Solas, right there and then. Solas comments on the wonderful, charged quality to the air, like "a prickling on your skin," and I can't help but wonder if this tantalizing glimpse of his former world (in which he felt more awake and alive) didn't subtly remind him of his real quest... and strengthen him enough to end his relationship with the Inquisitor he deeply cared for. 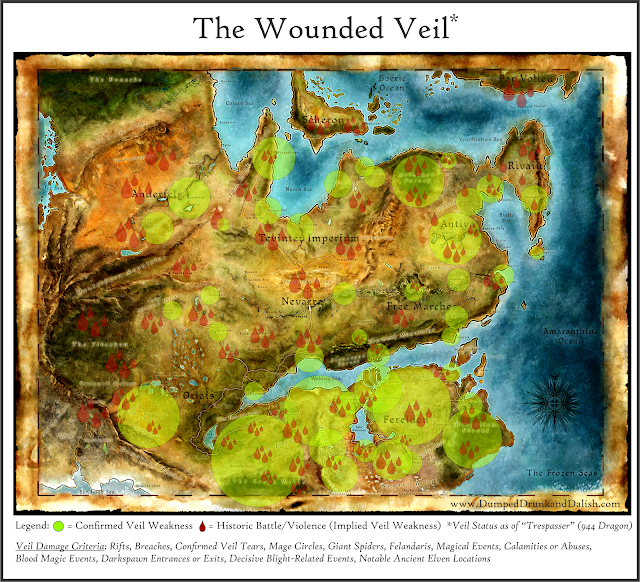 As Solas notes repeatedly throughout Dragon Age: Inquisition, the Veil is thinner, weaker or downright torn in places that have encountered extensive battle, magic, or death (especially blood magic). The Veil is evidently thinner at night than by day, and the thin spots are further weakened by spirits and demons who press against those places, attracted by the violence and death that took place. That snapshot attempts to provide a look at just how damaged the Veil actually is—in not just dozens but potentially hundreds of locations across Thedas. 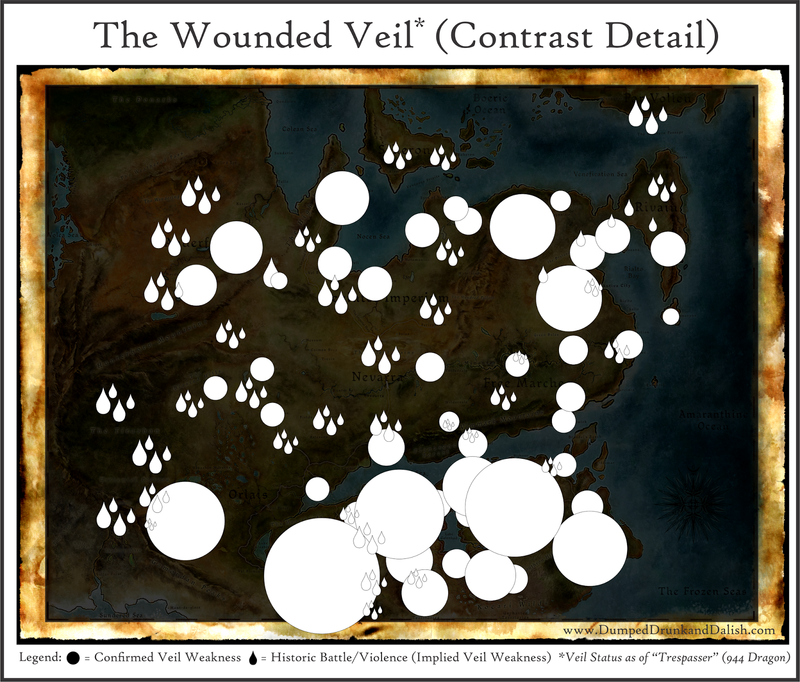 Note: I want to thank the following Dragon Age community members on social media for their generous insights and suggestions on identifying and notating Veil tears and thin spots across Thedas, including, on Twitter: @LadyIolanthe, @JoGirlieGirl, @ImaSithDuh and @Idunasappl, as well as, from the Dragon Age Universe, Steve Cornelius, Vernon Swain-Nisbet, Sarah Chung, Michael Sawyer, and more. And let's not forget Dalish encampments (hard to track due to their secretive and wandering ways), plus all those little bloody spots on my infographic... which detail every single place I could document across Thedas as offering battles or bloodshed at catastrophic levels. When we factor those into our portrait of the Veil, it's almost impossible to find a place that would be conceivably strong. The creation of the Veil was an act of almost unthinkable strength, accomplished by a mage at the height of his powers. But it was nevertheless the act of just one man, no matter how extraordinary, and it has permanently changed and warped a world in which it was never meant to exist at all. Meanwhile, beyond all of the damage I've detailed here, that Veil has also deteriorated, year after year, in several other implied and subtle ways since its creation. Take a look at this pure contrast graphic version I did of the Veil chart above, now reversed below. It details major damage only, not including the potential thousands of additional weak spots that presumably exist, as well. If this was a roof, you couldn't sleep under it. If it was a blanket, you'd throw it away. The point I'm getting to here is a simple one: The Veil wasn't meant to last forever. And currently, it's doomed. It's not just wounded, it's on life support (support provided, rather ironically and repeatedly, by Solas himself, along with those mystifying "ancient elven artifacts." When I first played DAI, I thought Solas was trolling us with those... but what if they were, in fact, placed across Thedas because he realized the Veil was fragile? Because he knew it was something that would need to be strengthened and maintained in order to function? If this is the case, then his relief at knowing "the wards are working" isn't hypocrisy anymore, it's genuine. Based on the information I've presented here, with or without a scattering of artifacts—and with or without Solas eventually yanking the whole thing down like a magician pulling a tablecloth—I think the Veil is doomed. So what happens next? Well, now that you mention it... let's examine those possibilities. Because I think they're less obvious than they seem... but that's my next blog post. And you can read it here! Meanwhile, did I miss anything? Please share your thoughts on the state of the Veil in the comments, and let me know if there are locations I didn't cover in my chart here, as I'll be continuing to update it periodically! "Speaking of which: It's somewhat ironic, but I can't help but wonder if that lovely and subtly thrilling presence of the thin Veil may not have been the very thing that ultimately doomed the Inquisitor's relationship with Solas, right there and then." And is it just me, or does Lavellan's body language expression suggest that she has NO IDEA what he's talking about? I'm not sure that she can feel it, tingling on her skin as he does. So that might have been another nail in the coffin - in spite of what he sees in her, she is not Elvhen like him, and this interaction reinforces for him the idea that she never can be. Thanks for reading (and for your invaluable help on noting the Veil's weaknesses)! This is an interesting question. For me, I always assumed she felt what he was describing, but would not have recognized or understood it until this moment, when he explained what they were experiencing. Based on their romance as a whole and the implications of some of the conversations and banters, I don't think Solas dumps Lavellan because he finds her lacking in that kind of way. Patrick Weekes has also posted a lot about how much Solas loves her, and that breaking it off is something he does protectively, in fact, because he was about to tell her everything (and then immediately realized that the relationship had become a liability to his plans). This is why I think he can both love her deeply, but stand in that electricity of the thin Veil and go, "I have to stay the course." 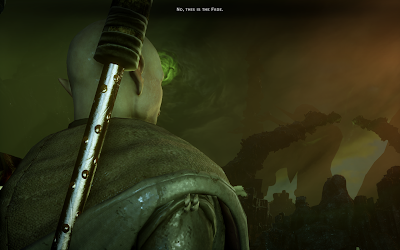 Your idea is definitely intriguing and more than possible, but for me, I always feel that Solas actually feels the reverse -- a sense of real kinship and a kind of relief at the connection with the Inquisitor. He is so palpably lonely as a character that his euphoria in their romance is very poignant to me. And I adore the entire final conversation in "Trespasser," where he is finally able to be open and honest. Oh, I didn't mean to imply that he found her lacking as a match for him. I don't think that's the case at all, and Patrick Weekes has definitely said on more than one occasion that Solas truly loved her. Solas does, however, continue to insist that she is not 'his people' even into Trespasser. I know that a lot of people explain that away by saying "DAI was originally meant for a human protagonist only" but Trespasser was done some time after the decision to include elves, dwarves, and Qunari as playable races had been made, so it should have been possible to write it with all races in mind, and I believe it was. There's definitely content that a Lavellan gets that no other Inquisitor gets in Trespasser. Yet Solas still clearly classifies all Inquisitors, including a romanced Lavellan, as 'other' than him, based on what he says in Trespasser. So when he dumps her, I feel it's his sense of duty to his own people that prompts him to do so - not that he felt she wasn't up to snuff. I agree that he decided his feelings for her were a liability. What I was trying to suggest was that her being 'other' in his eyes during their last date was just another reminder of the duty he feels towards his own people. I think it's quite possible that this contributes to his palpable sense of regret about what he must do that was delivered so beautifully by Gareth David-Llloyd and John Epler in Trespasser.